Have you got a cracked or broken Laptop Screen or Notebook Screen? We can replace your broken Laptop or Notebook Screen and have you up and running again quickly. Our Parts Suppliers has a wide range of quality replacement Laptop Screens to suit most brands at reasonable prices. We get asked the question all the time. Is it worth repairing my broken laptop by replacing the screen? Well the short answer is yes most of the time it is worth it. It is usually much cheaper than buying a new laptop. Of course this is dependent on the Brand, Model and Screen Size, but as a general rule of thumb, Laptop Screen Replacement is a worthwhile exercise and will be cheaper than a new Laptop. Having said that, to determine the cost of repair we need to remove your old Laptop Screen and obtain the Part Number from the rear. Once we’ve done that, we can give you a fixed price quote. One point to note is that the Plastic Bezel that surrounds the Laptop Screen can get brittle over time and may crack or break during the removal process and may need to be replaced too. 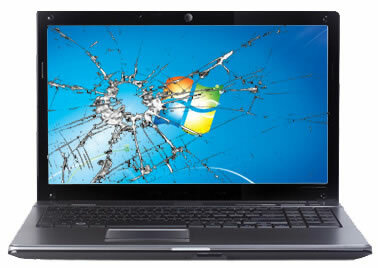 Laptop Screen Replacement is one of our specialties, so if your Laptop Screen or Notebook Screen is cracked or it just isn’t displaying anything at all, then why not give us a call and see what we can do for you. You might be surprised. You may also be interested in Computers and Laptops, Second Hand Used Laptops and Screen Repair Article.